Concept: This early successional Vegetation Type (VT) supports a mixedwood canopy of black spruce and pioneer hardwoods including large-tooth aspen and trembling aspen. Residual trees having survived past disturbances are often present, including large over-topping white pine and red oak. These residuals have important ecological value, but their presence has minimal significance in classifying this VT. Black spruce – Aspen / Bracken – Sarsaparilla usually follows stand-replacing disturbance events such as fire, windthrow or harvesting. Vegetation: Black spruce, large-tooth aspen and trembling aspen are the dominant overstory trees, along with white and grey birch, red maple and red oak. The shrub layer is dominated by lambkill, velvet-leaf blueberry and wild raisin. Black spruce, white pine, balsam fir and red maple regeneration can also be extensive. The herb layer consists primarily of sarsaparilla, bracken, bunchberry and wild lily-of-the-valley. Schreber's moss and wavy dicranum are the dominant bryophytes. Environmental Setting: SP8 is associated with dry to fresh-moist, nutrient poor soils. 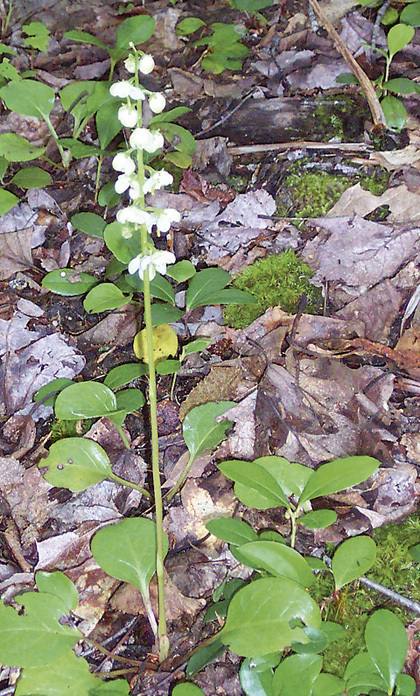 This VT is commonly found in the Northumberland Bras d'Or ecoregion but can be found throughout Nova Scotia on a variety of soils with low nutrient status. 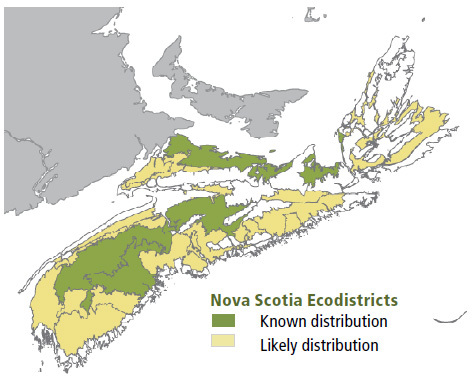 This VT is widespread and common across the Maritime Provinces, although large-tooth aspen is found less frequently outside Nova Scotia and southern New Brunswick. Successional Dynamics: Nutrient poor soils and stand-replacing disturbances strongly shape both VT canopy structure and successional patterns. SP8 is primarily an even-aged, early successional VT that follows stand-level disturbances such fire, windthrow or harvesting. Possible successional stages include SP4a (White pine / Blueberry / Bracken variant Black spruce), SP5 (Black spruce / Lambkill /Bracken), SP6 (Black spruce – Red maple / Bracken – Sarsaparilla) and SP9 (Red oak – White pine / Teaberry). Ecological Features: This closed or open forest forms large-patch ecosystems following stand-level disturbances in many parts of the province. It provides several ecological functions including nutrient cycling, rapid site regeneration, and nurse crop protection for later successional species such as white pine and red spruce. Excessive surface stoniness is common, limiting the extent of canopy development. Black spruce has intermediate shade tolerance and does not seed well under closed canopies. Vegetative regeneration by layering is common in black spruce, producing small clonal groups. However aspen regenerates profusely from root suckers when disturbed, producing extensive clonal colonies which may also support large fungal associates such as shoe-string root rot (honey mushroom). Aspen is an important tree for cavity nesting birds, and its buds provide winter food for ruffed grouse. Other bird species that may be found in this habitat are vireos, ovenbirds and veery. 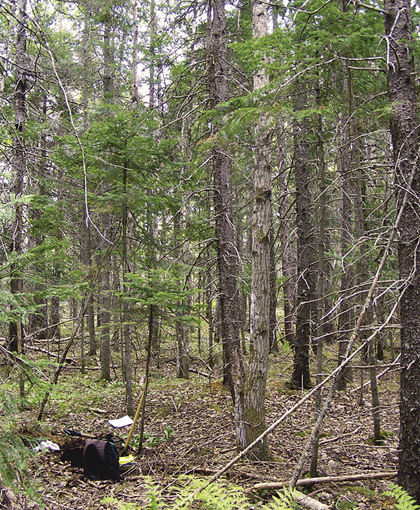 Distinguishing Features: A mixedwood forest of black spruce on well drained nutrient poor soils, with either large-tooth or trembling aspen as the dominant hardwood species. Sarsaparilla, bracken and bunchberry give a leafy appearance to the understory. Lambkill and blueberry are extensive.